I was recently asked this question by a pre-service teacher in the Saginaw Valley State University teacher mentor program: "What was a successful science experience in your classroom, and how did you measure that success?" The question really got me thinking, and I wanted to try and capture the essence of my thoughts. The essence of success in teaching and learning is student engagement. It is like the holy grail to have all the students engaged, especially in high school science. The highly engaging classroom will be the one that fosters the most success. When all students are engaged in a science experience, it is that very engagement which leads to their success with the experience. I measure success in the learning experiences created in my science classroom by the level of student engagement I observe. Lessons that are hands-on and utilize current technologies with which students are familiar have been most effective to successfully engaging students in the science content; furthermore, if the content is related to students’ lives, it will be more meaningful to them and they will be more engaged and thus successful with it. One engaging science experience I have created for students dealt with electromagnetism and sound. Students had been learning about electromagnets, and the associated concepts were connected with concepts from the study of sound in our physics classroom through project-based learning. Students were challenged to build computer speakers using their knowledge of how speakers worked and the function of various materials. They were given the challenge of building a speaker that could play music from a computer using a given set of materials. Unexpectedly to students, the materials list consisted of a Styrofoam plate, some cardboard, sheets of printer paper, a few business cards, Scotch tape, speaker wire, ceramic disc magnets, and hot glue. Using what they knew from physics concepts and what they researched about the speakers and materials, students constructed speakers that had a Styrofoam plate cone, and a small voice coil all affixed to the cardboard in varying sizes and designs. After completion of the two-day project, students connected their speakers to an iPad 2 and played music through them. My objectives for the lesson were for students to apply knowledge of their physics concepts, research properties of the given materials relative to the project, and problem solve to create a working speaker. In groups, the students met the objectives for the lesson and every group attempted to build a working speaker, though some speakers did not function as well as others in the end. The way I was able to gauge success in this lesson, however, did not come from the ends but rather the means of completing this project. Some students attempted a design that they thought would work, but then learned quickly it had some critical flaw. Those students corrected their mistakes and accordingly adjusted their product. Additionally, I saw students start to share experience of difficulties with the construction or unreliable design methods with one another. Students who saw other groups struggling offered suggestions to them for improvement on their design, such as pertained to the number of times the wire needed to be wrapped to make a better voice coil (electromagnet.) Students collaboratively dealt with the design problems that arose and troubleshot all on their own without any prompting. This was unexpected! Though students were collaboratively engaged in the process of constructing the speaker, the strongest indicators of success in this science experience did not come from just observing them build the speakers but rather what happened after they finished their speakers. When students came up to test their speaker and hook it up to the iPad 2, they were astonished to hear Lady Gaga playing through their own Styrofoam plates and watch the plates vibrate with the song. They could not believe the speakers actually worked and, furthermore, how well they worked. Students immediately began calling over their friends to hear the speakers that they had built. They compared the sound quality of different speakers and began interviewing other groups to discover what they had done differently to yield a better speaker. Some students asked if they could use excess materials to construct a second speaker, because they now had an idea of how they could make a better one. Finally, someone asked the group what they thought would happen if they tried wiring all the speakers together according to what they had learned about series and parallel circuits. Immediately, after the question was asked about wiring the speakers together, several students started to draw out a diagram for how the speakers needed to be connected to make a circuit. They tested various combinations until they found what led to the loudest Styrofoam plate speaker system. This lesson went so much further than my original learning objectives, because the students were excited about the project, were not hesitant to apply their knowledge, worked collaboratively through problem solving, and extended their own learning beyond the scope originally expected for the project. It was a successful science experience, because the students were all engaged in the entirety of the lesson and wanted to take that learning further than planned on their own. What more could a teacher ask for? Density is an important concept in the physical and life sciences. Density carries a significant physical meaning that relates the amount of mass an object possesses to the volume it occupies. Yet this unique property of matter is often separated from its physical meaning to instead focus on the calculation of quantities associated with density. Students do not develop a strong conceptual sense of density, despite the fact that many students can perform density calculations. Students' reasoning should not be sequestered from the calculations they perform (Reif, 1995); however, often through the use of algorithmic teaching methods, the learning that is displayed and is not a true indication of conceptual attainment learning that has taken place. Students "fake it to make it," which is to say they can perform the calculations without having any sense of what it all physically means. This later leads to learning that cannot be transferred to other contexts outside of the original learned algorithm or typical practice problems (Darling-Hammond, Low, Rossbach, & Nelson (2003). When density is presented with only minimal attention on the concept itself, students lose sight of the physical implications of density and become imbued with a sense that density is just another equation they have to memorize and use. This is very poignantly illustrated with the use of the "density triangle" or any variation thereof (see right.) 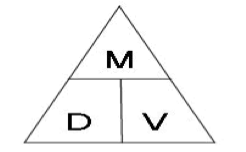 Knowledge of how to use this triangle algorithm is easily acquired by most students, but this method is a gross decontextualization from the physical meaning of density, mass or volume. Furthermore, students who use the density equation to solve problems and perform calculations, or those who use the triangle algorithm, are usually just shown to do so by their teacher through some form direct instruction. This further obfuscates the density concept and students' construct of a physical meaning for the equation. In an effort to implement research-based practices to elucidate important concepts, two adjustments to the teaching methodology associated with the density concept are suggested: 1) the learning should be active and cooperative (Marzano, 2004); and 2) the physical meaning of the density concept and related equation must be constructed with students before calculations can be performed. Using an inquiry based approach to teach the relationship between mass and volume can help to develop the mathematical model for density as well as a conceptual sense of that relationship. This resulting equation, which should then have a physical meaning, can be used to solve problems and further develop students understanding of the density concept. The suggested instructional strategy that will be the focus here to achieve the desired learning of the density concept will be Problem-Based Learning (PBL) and will be used in sequence with the inquiry method. Ultimately, teachers want students to be able to use the density concept to do something, e.g., uniquely identify unknown substances, compare how fluids or solutions may interact when mixed, or to determine whether or not an object might float when put into water. These example tasks require more than a mere calculation to be successful. The PBL strategy and inquiry approach, when properly used in sequence, will allow students to construct a sense of density, derive the density equation, and solidify their knowledge as they stretch the density concept further by solving a novel problem: determining the density of a person--the density dunk tank experiment. All activities and experiments in this sequence should be done using cooperative learning groups. Student lab groups should be assigned to be heterogeneous, where each member of the group has a specified role. This facilitates their working together and prevents dominating lab partners from getting all of the value out of the activity. The class as a whole will serve as one cooperative learning group, but individual lab groups should be selected ahead of time (unless you have an established lab group protocol that you cannot give up.) More information on CL groups in the resources below. The detailed handout explaining how to conduct each of the steps in this learning progression of the density unit, and including the full lab for the density dunk, can be found here on the ChemEd handout page of my website. · Collins, A., Brown, J. S., & Holum, A. (1991). Cognitive apprenticeship: Making thinking visible. American Educator, 15(3), 6-11, 38-46. · Darling-Hammond, L., Low, B., Rossbach, B., & Nelson, J. (2003). The learning classroom. S. Burlington, VT: Mort Crim Communications, Inc.
· Levine, M. (2002). A mind at a time. New York: Simon & Schuster. · Marzano, R. (2004). Classroom instruction that works: Research-based strategies for increasing student achievement. New Jersey: Prentice Hall. · Reif, F. (1995). Understanding and teaching important scientific thought processes. Am. J. Phys. 63(1), 17-32. The following is the philosophical motivation for the use of "for every" statements in the classroom. Making the slight adjustment, which I propose in the following paper, to the language you use in talking with your students about proportions and ratios can make all the difference for their understanding, especially with students who are still concrete thinkers. This paper was presented at ChemEd 2011 at Western Michigan University in July of 2011. The "For Every" Speak handout, which contains robust examples of use and explanations, from the full presentation that was given at ChemEd 2011 can be found on the ChemEd page of my website. According to Piaget, proportional reasoning is an essential cognitive function that indicates the formal operational stage of cognitive development (Santrock, 2008). The ability to think in an abstract fashion, as is associated with the formal operational stage of cognition, is necessary to the successful study of chemistry (Lythcott, 1990). Beyond the concrete properties of matter and the directly observable features of chemical change, the study of chemistry includes abstract (and sometimes nebulous) concepts. Some of these topics are quantitative in nature, such as dimensional analysis, stoichiometry, and equilibrium, requiring sound mathematical talent to successfully master them. Often, students struggle with the chemistry when their math ability, especially their proportional reasoning, is underdeveloped (Lythcott, 1990). Students can become easily intimidated and discouraged by a struggle with chemistry that is in reality a fledgling ability with mathematical reasoning. If teachers of chemistry do not address the disparity with math ability in students' chemistry performance, a struggle with the content for many students will be inevitable and meaningful learning will not take place in the chemistry classroom (Krajcik & Haney, 1987). Arons (1996) describes that proportional reasoning is a fundamental skill that students need in order to be successful in any science discipline. Demonstrating successful proportional reasoning ability is a telltale sign of good scientific thinking. To better assist all students, and not merely 'luck out' with teaching the mathematically strong students in the chemistry classroom, physical meaning must be explicitly connected to quantities and the relationships between quantities must be explicated (Hestenes, 1987). Building the conceptual understanding behind chemical quantities will allow students to relate those quantities in all situations and reason through quantitative problem solving. By treating the quantitative aspects of the study of chemistry with concrete pedagogical approaches, students can more easily attain the concepts behind the principles, reason their way to a solution, and transfer their learning to a novel situation (Darling-Hammond, Low, Rossbach, & Nelson, 2003). When you honestly consider the majority of students in a typical chemistry classroom, they are within the early years of teenage development. According to Vygotsky, to most successfully work within a student's zone of proximal development during this age, teachers' instructional methods must appeal to the concrete operational thinking that is characteristic of this developmental period (Darling-Hammond, et. al., 2003). Merely teaching chemistry in a way that relies upon algorithms and strong mathematical abstract reasoning appeals only to students who are further cognitively developed. This method will not be effective; furthermore, it can serve as a discouragement to students whose present stage of cognition is mismatched to the instructional methodology. The language teachers use to communicate physical meanings of quantities and relationships can either promote algorithmic memorization or support useful learning. Avoiding the algorithmic pitfall, that will surely lose a number of students in the teaching process, is possible. This can be achieved by making a very small adjustment to the language used to talk about chemical quantities, proportions, and relationships (Cramer & Post, 1993). Utilizing traditional language such as, "100 centimeters is equal to one meter," can give students a sense of the magnitude of quantities of length or the relationship between their magnitudes; however, this is of little use to students when they go to think about the physical meaning of the quantities or determine the number of centimeters in 13.4m (Lesh, Post, & Behr, 1988). Without an algorithm for using that equality, students have no reliable means to arrive at an answer for the number of centimeters in 13.4m. There is no mathematical operation or procedure embedded in the language used to describe the relationship; therefore, it is effectively and functionally useless to employ this language as a primary means of talking about quantities, relationships, or solutions to problems. To illustrate the impact that language can have on the way we conceptualize mathematical quantities or operations, consider the difference between English and Chinese Language. Take the example of how we refer to the fraction 3/5. In English, we say, "three-fifths," which tells nothing about the relationship between the numerator and denominator. In fact, many students become used to referring to 3/5 as, "three over five." This is neither an accurate interpretation of the fraction nor a useful one. What does "over" mean as a mathematical operation? Ineffective language where 3/5 means "three-fifths," reduces fractional relationships and ratios to tacit facts not functional knowledge. In contrast, consider the Chinese language for the fraction 3/5, which would translate, "for every five parts, take three." This interpretation of the fraction uses functional language that contains a concrete conception of the relationship represented by the fraction (Gladwell, 2008). Knowing that 3/5 means, "for every five parts, take three," can lead to a cognitive process of determining how many equivalent parts would you take in a group of ten parts. One could proportionally reason that since ten are twice five that twice as many as three would be the answer. Even if students struggle with the multiplication operation, they could still reason their way to the corresponding solution steps using "for every" language, because they could prove what the answer would be based on reason. Gladwell continues to posit that the power of embedding instructions into language empowers thinking about mathematics. The second most powerful example, according to his argument, describes how the counting system in China is very intuitive. In English, we would say the number '13' as "thirteen," but in Chinese they would say "ten-three." This pattern continues in Chinese, as the number '25' is called "two tens-five;" in English, we say, "twenty-five." This subtle difference entails having to think about more or less information when doing calculations. In English, to add '13 + 25' we have to know what thirteen and twenty mean, and then we combine them algorithmically. In Chinese, they base it on the number of 'tens' and the rest is just the 0-9 counting numbers. So in Chinese, saying '13+25' contains the instructions for adding it: "ten-three and two tens-five." This easily allows the Chinese student to calculate the answer "three tens-eight." Though it is a consequence of language differences that students become used to thinking about fractions, ratios, proportions, and calculations differently, in English we have the option of using functional language to describe quantities. Using "for every" statement language to describe quantities and relationships contains cognitive instructions for thinking one's way through solving a problem. Algorithmic methods are typically what teachers rely upon to help students solve proportional reasoning problems, because that's what they were shown by their teachers before and it "made sense" to them, e.g., predict the theoretical yield of a certain chemical reaction based on a starting masses of the given reactants and show your work. The typical approach used is the cross-cancelling table method. This is the one with a tic-tac-toe board where quantities and units are matched up so that the units cancel and give rise to the desired unit. The issue with an algorithmic approach is two-fold: first, solving the problem using an algorithm does not necessarily entail or demonstrate understanding of the relationships between the quantities being compared; second, if an algorithm is taught in lieu of the physical meaning behind the quantities in the algorithm (the shortcut first instead of the circuitous route) then the algorithm takes on no meaning. Some students can pick up on algorithms and arrive at the right answer fairly efficiently Algorithms can be utilized, but not until after a student truly understands and demonstrates proficiency with the concept and their reasoning through a problem (Darling-Hammond, et. al., 2003). In order to successfully use algorithms, they cannot just be shown to students for memorizing the procedural steps; instead, the thinking that underlies the algorithm, which is the proportional reasoning, must be made transparent to students through a cognitive apprenticeship (Collins, Brown & Holum, 1991) that includes scaffolding, coaching, and independent practice with the steps prior to implementation of the algorithm. Consider the following question: "What is a ratio?" A fundamental answer explains that a ratio a comparison of two quantities. Most frequently, students are introduced to and exposed to ratios in a pure sense, using numbers without physical meanings, often in a mathematics course. This leads to the disconnection of ratios from the physical meanings of the quantities they relate as well as a tendency to utilize poor representations of the ratio (Karplus, Pulos, & Stage, 1983). As students gravitate toward, "three over five" language to represent 3/5, the ratios become decontextualized even before they get to a science class (Krajcik & Haney, 1987), let alone a chemistry class. Since many students enter the study of chemistry still at a concrete operational stage of cognition, it is important that proportional reasoning is utilized in a concrete way (Lawson, & Renner, 1975). The "for every" statement language can effectively accomplish maintaining a connection between the physical meanings of ratio quantities and the relationships between them; furthermore, "for every" statement language provides a reliable means of problem solving and reasoning that can easily transfer to novel contexts. By employing "for every" statement language in the chemistry classroom, teachers can reach students at a concrete operational level, creating a springboard for developing proportional reasoning skills (Cramer, & Post, 1993) and making quantitative problem solving less intimating. Students who have fewer struggles with the mathematics involved in chemistry are more likely to approach the content with confidence and be successful with it. Using "for every" statements is a way to elucidate how to think about the quantities to students while preserving the physical meanings behind quantities. This small change to the way we refer to ratios and have students think about ratios will yield large returns of success in the long run from dimensional analysis to stoichiometry and beyond. · Arons, A. (1996). Teaching introductory physics. New York: J. Wiley & Sons. · Cramer, K. & Post, T. (1993). Connecting research to teaching proportional reasoning. Mathematics Teacher. 86(5), 404-407. · Collins, A., Brown, J., & Holum, A. (1991). Cognitive apprenticeship: Making thinking visible. American Educator, 15(3), 6-11, 38-46. · Gladwell, M. (2008). Outliers: The story of success. New York. Little, Brown & Co.
· Hestenes, D. (1987). Toward a modeling theory of physics instruction. Am. J. of Physics 55, 440-454. · Karplus, R., Pulos, S., & Stage, E. (1983). Early adolescents' proportional reasoning on "rate" problems. Educational Studies in Mathematics. 14, 219-234. · Krajcik, J. & Haney, R. (1987). Proportional reasoning and achievement in high school chemistry. School Science and Mathematics. 87(1), 25-32. · Lawson, A. & Renner, J. (1975). Relations of science subject matter and developmental levels of learners. Journal of Research in Science Teaching. 12(4), 347-358. · Lesh, R., Post, T., & Behr, M. (1988). Proportional reasoning. In J. Hiebert & M. Behr (Eds.) Number Concepts and Operations in the Middle Grades (93-118). Reston, VA: Lawrence Erlbaum & National Council of Teachers of Mathematics. · Lythcott, J. (1990). Problem solving and requisite knowledge of chemistry. J. Chem. Educ. 67(3), 248. · Santrock, J.W. (2008). A topical approach to life span development. New York: McGraw-Hill. In the education profession, your main focus should be students; however, you must take care of yourself before all else. If you are out of balance in your life, your teaching will be out of balance. If any one of these five pillars is out of synchronicity with the others, you will feel out of balance in your career and life. o Make time for socializing, e.g., date night, Saturdays at Jeff's to watch the game, etc. Though I cannot tell anyone how to live their life, I do get asked frequently what my "secret" is to the success I have seen. For me, it is not a secret. The glory all goes to God, who put me in the right situations to learn all that I know, but what I have learned is what I offer here for your equal success. Achieving balance in your professional career as a teacher and, more importantly, in your life is the foremost obligation you have to yourself and others. Hopefully, these quips of wisdom will mean something to you in some way. 50/50: What Accounts for Whether or Not Teachers Last Five Years? This fall will mark my fifth year teaching high school science. I have taught biology, chemistry, physics, and physical science at all different grade and ability levels. Additionally, this past year I became an adjunct faculty member at the college of education for Saginaw Valley State University. I have taught courses in learning theory, middle and secondary pedagogy, and educational philosophy. Regularly, I push my high school students to reflect on process. I expect them to enumerate the steps that bring them to a solution or to make their thinking visible in both linguistic and non-linguistic representations. My teacher education students and graduate students are held to a similar standard: I implore them to reflect on what they do for teaching and learning and how they do it all the time. The nature of the content of the education courses requires copious reflection and consideration for what is best practice in the education profession. Despite all of these expectations to reflect on what's best for the profession, less often is there focused reflection on what is best for the professional. This summer, I have found myself reflecting on my own teaching more than ever. Maybe it is that I am entering a milestone year (when I started teaching, some wise mentor told me, "half of teachers leave the profession in their first five years.") It may just be that witnessing all the reflection my students do has rubbed off on me more than ever before. Regardless, I am happy to be entering the year where I have overcome the looming statistical intimidation, though I am not sure what it is that makes a difference for the other 50% of teachers. Sure, some just envisioned it in an unrealistic light or others did not get the proper preparation, but all things being equal: why do only half make it through five years? I reflected a lot on this question and my thoughts eventually turned inward: what kept me from leaving? How did I get to be in the 50% that 'beat the odds?' After some careful consideration, I realized that my first year, like many others' first year, was a challenge full of adjustments that I did not see coming. Over time, I acclimated, adapted, and accommodated all that was required to be a successful professional. This helped me to be on my best game in every aspect of my career every day for my students. When I compared my experience to that of some stressed out contemporaries in the field, as well as some other noteworthy exemplars, I found that there was something I had figured out that allowed me to flourish. There was a piece of advice that made all the difference for me, which led to me figuring it out, that maybe those other 50% had not known. Someone told me (not the same mentor who gave me the statistics) that I should "strive to always be present in all that [I] do." It was a very nebulous adage at first, but it eventually became part of my professional and personal mantra. In order to be present, you must be fully and completely conscious as well as conscientious to what is going on in the current time and place. This does not mean just being physically present but also mentally present. You have to focus on the immediate to be present and when you do, your attention and efforts can be concentrated then and there for the best use of your talents & energy. If you are feeling like this interpretation of the advice is pretty tacit or obvious, it's because you're missing the implicit. The original focus of this advice for me was the instruction to be present. I didn't understand what this statement meant until I shifted to focus on the instruction of where/when to be present: in all that you do, be present. Being present in your career is necessary and will help you to be your best in what you do, but being present in all that you do will allow you to be balanced in your life. When you attend to giving your fullest presence to everything you do, you can develop all the areas of your life to their fullest and integrate those aspects of you to make the best you. A balanced you can take on anything, and a balanced you will succeed in your career far more than an unbalanced you. This philosophy on life has helped me in my professional career and personal life. It keeps me in check, yet keeps me striving for my best. The principle of achieving and maintaining balance in my life has been paramount to my staying in the profession. Like the 5 Juggling Spheres inspirational story, I have identified five areas of my life in which I strive to maintain full presence. 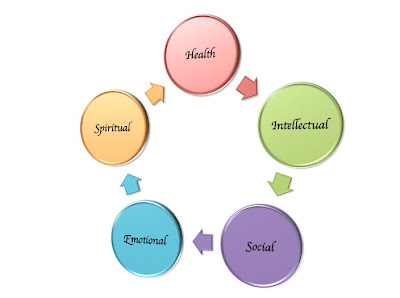 For me, it has been presence in health, intellectual, social, emotional, and spiritual aspects of my life that have made be a balanced person and professional. This has been a developing work on my part, not a balance that I have always had, but the key to remaining pleasantly employed in the teaching career. If any one of these pillars of my life, as I fondly refer to them, gets less of my presence than the rest, I do not feel right. I feel out of balance when I do not have an equal footing in all the pillars of my life. Now, as I enter my fifth rewarding year as a high school science teacher, and now college faculty member, I make it a point to tell my students about finding their own balance. It is above and beyond critical to have good health, developed intellect, a supportive social life, stable emotional wellness, and identified sense of spirituality. These pillars of balance may be associated with different specifics for different individuals, but their essence is the same. For all the new teachers out there, seek balance in your life by being present in all that you do and the career success you want should fall into place.